With my first daughter, I could never see what the fuss was about with teething. She would go to bed one night, happy as could be and wake up with a new tooth. We had a few teething toys laying around, but she honestly never needed much of anything to get through teething and I was lulled into a false sense of what a teething baby was like. When my second daughter was six-months-old she started screaming for days on end, she had a runny nose and a slight fever and was absolutely miserable. I ending up taking her into the doctor, who laughed a little bit and told me it was just teething. This was teething? It was worse than I could ever imagine. I started looking up every teething trick in the book. 12 teeth and a year later, we finally have teething down. A combination of Infant’s Advil and homemade yogurt teething pops have made all the difference. Yogurt teething pops are easy to make, have good, natural ingredients in them and they are absolutely delicious. My 6-year-old even loves to eat them! I make two different types, Strawberry Banana and Orange Creamcicle. My girls loves both. 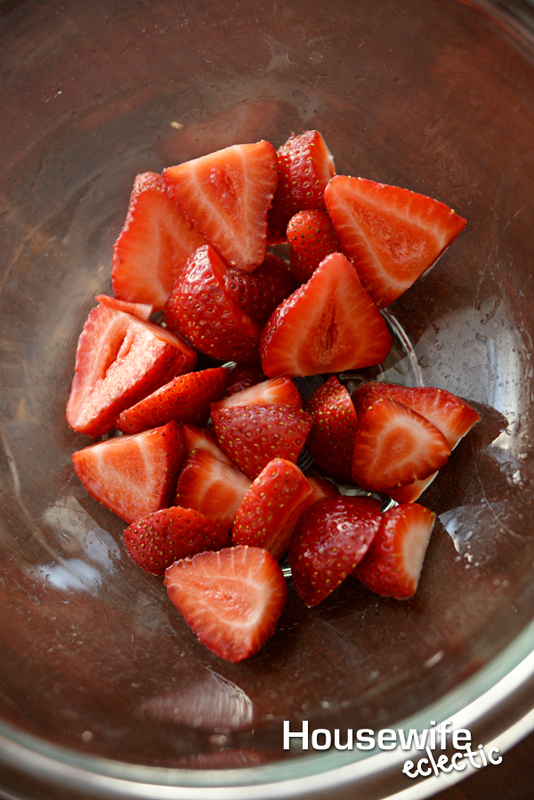 Take the stems off your strawberries and wash thoroughly. When I make these pops I either chop up half a banana and use vanilla yogurt or just use banana yogurt. 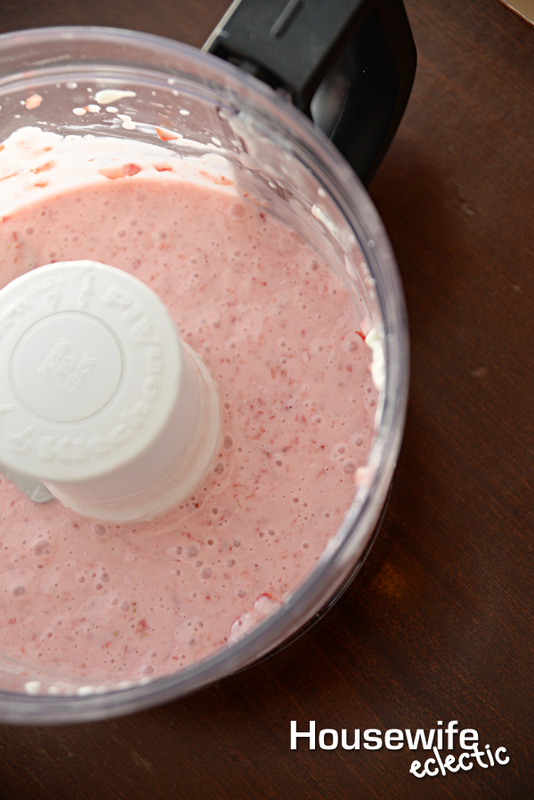 Place about a cup and a half of yogurt and your berries in a blender or fruit processor. Blend until smooth. 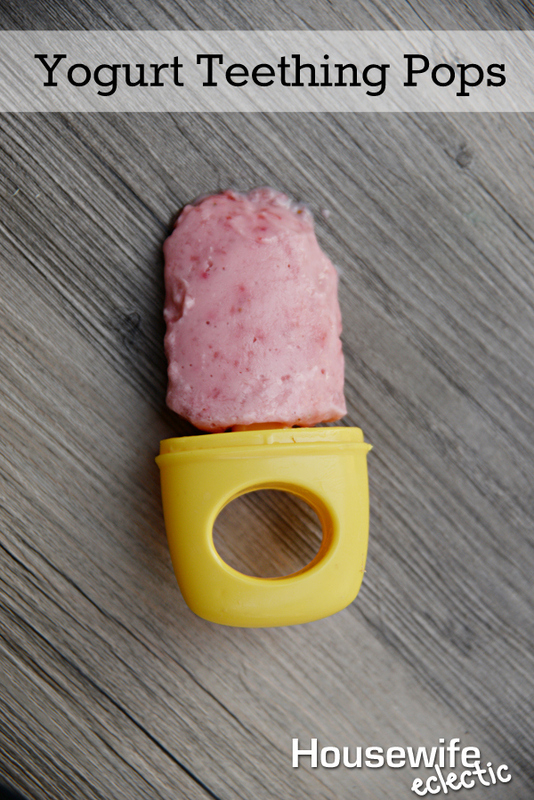 Use a funnel to fill your Popsicle molds full of the mixture. I like using a funnel instead of just straight pouring to make sure that no big chunks of fruit make it into the Popsicle molds. If you have a really good blender, this is probably an unnecessary step. 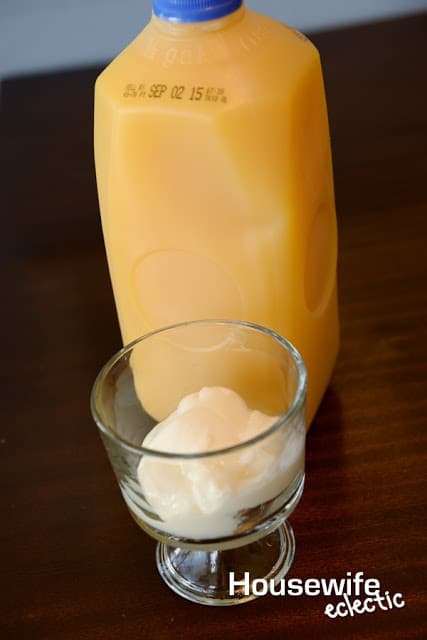 Mix the yogurt and orange juice together until well blended. You will want a couple of tablespoons of orange juice to every cup of vanilla yogurt. Pour the blend into your molds. Freeze your Popsicle for 6-8 hours, but preferably overnight. 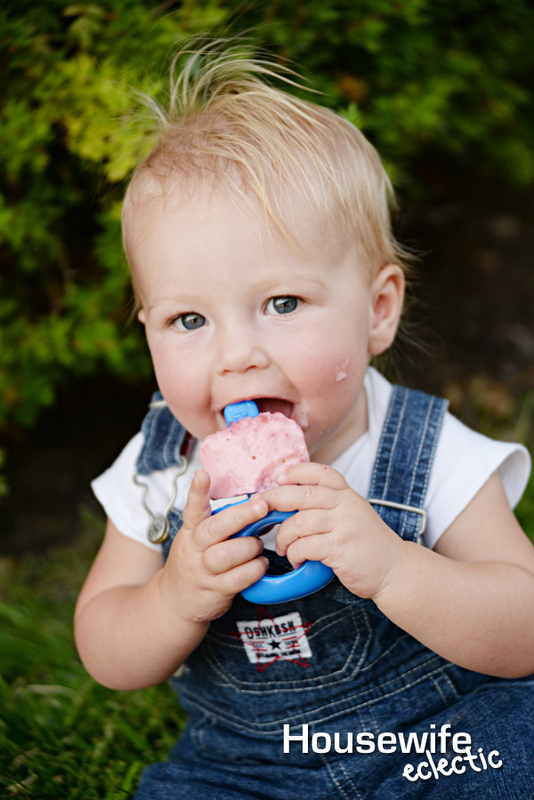 When your little one has teething problems pull a Popsicle out and let them munch on them, letting the cold soothe their gums. 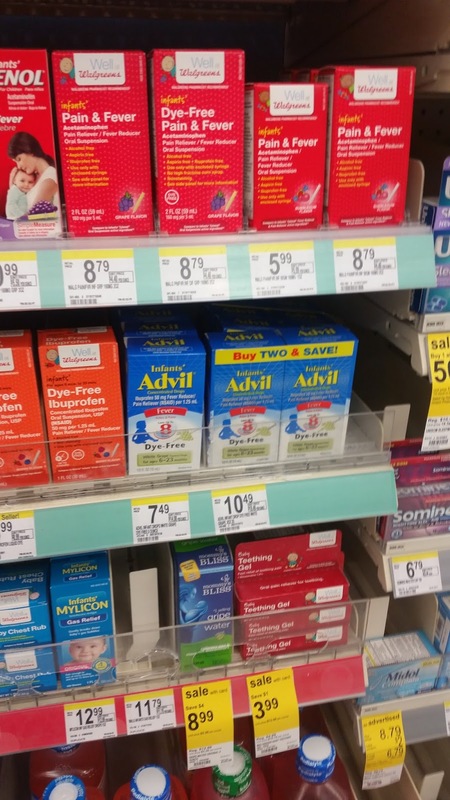 Along with our homemade teething pops, when my little one’s fever and teething pain gets unbearable we head to Walgreens to grab some Infants’ Advil to help her pain. I use Infants’ Advil because Infants’ Advil® is available for infants ages 6 to 23 months old in a non- staining, Dye-Free White Grape liquid. 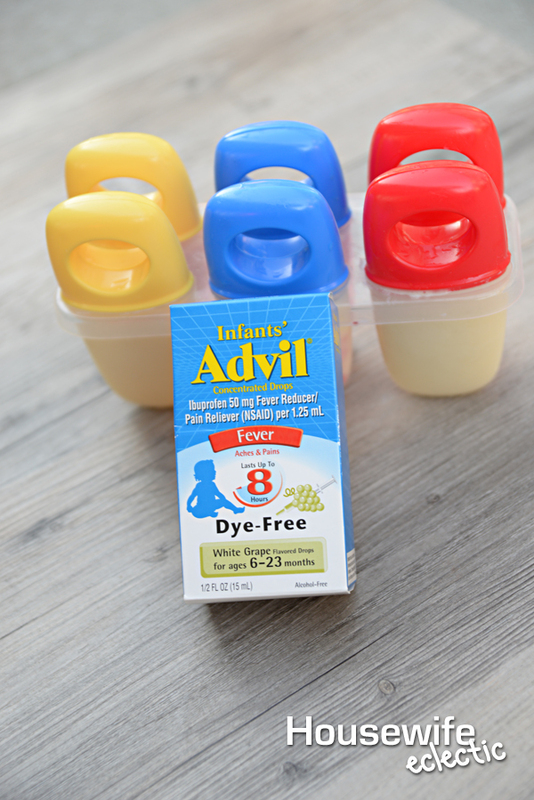 Infants’ Advil® contains ibuprofen, the medicine pediatricians use most for their own kids’ fevers. 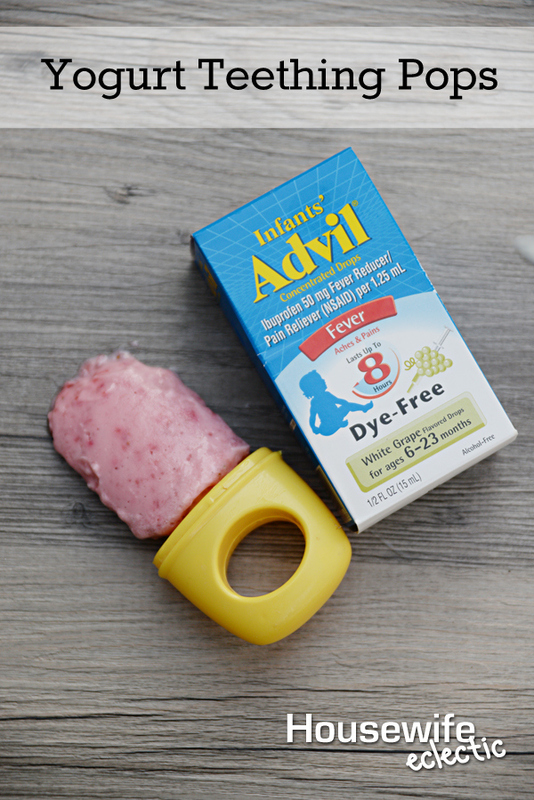 Infants’ Advil® contains ibuprofen, the medicine pediatricians use most for their own kids’ fevers. Offers parents a simple, effective solution to relieve their babies’ pain with up to 8- hours of relief in just one dose. I am extremely grateful for the combination of remedies that has taken four days of screaming for each incoming tooth to just a couple days of staying on top of remedies. I love having that sweet, happy, messy Popsicle smiling back at me instead of crying in pain. Who wouldn’t be happy to see that darling face? 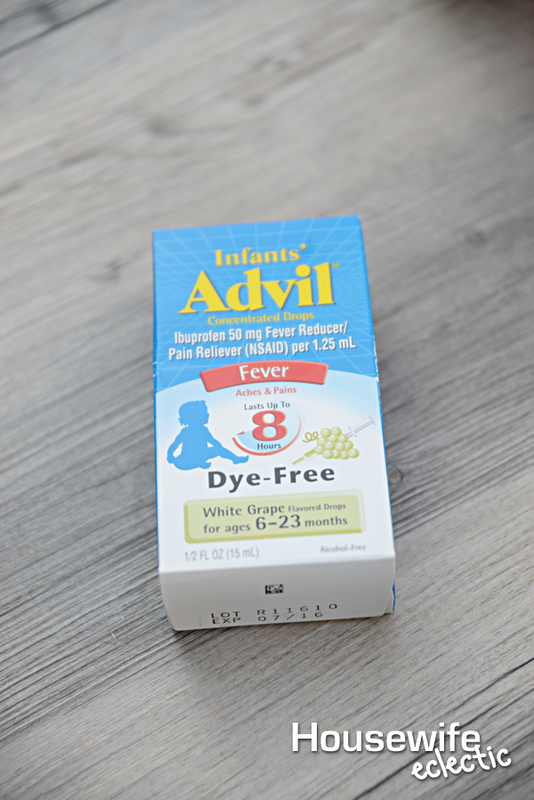 Check out this coupon for $1.50 off Infant’s Advil for the next time you have a sick or teething little one! 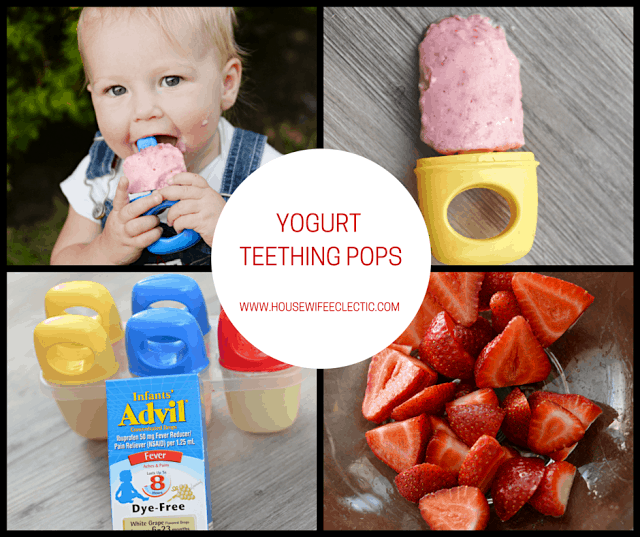 What is your favorite teething remedy? 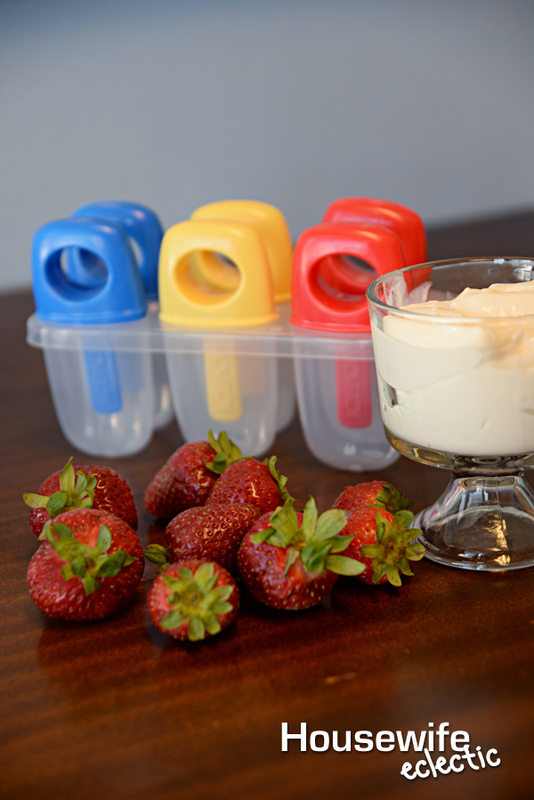 Oh, what a yummy treat for them while teething! This looks so good. That is such a great idea. My daughter did really well with teething but I would have loved to do this for her. 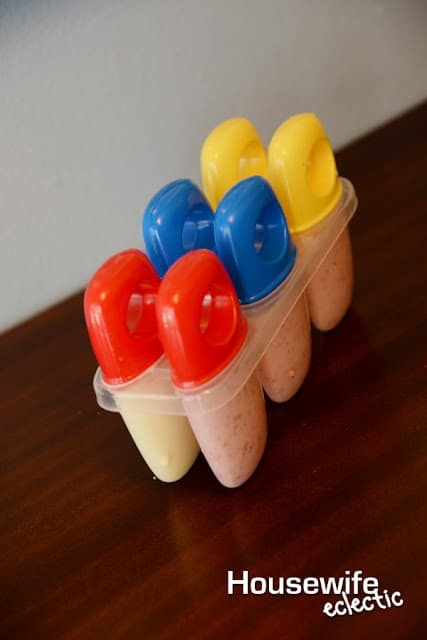 Great idea to help little ones when they are teething and sounds delicious. My grandson will be 6 months old soon. I'll be sure to pass this along to my daughter. My boys are well past the teething stage, but I think they'd love these pops. Orange creamsicle sounds yummy. Definitely passing this information on to those I know who have teething babies. Tooth pain is unbearable for adults-and those poor kids don't know what hit them! This is taste good for infant, I will refer this to my friend of mine. Thanks for bright idea. 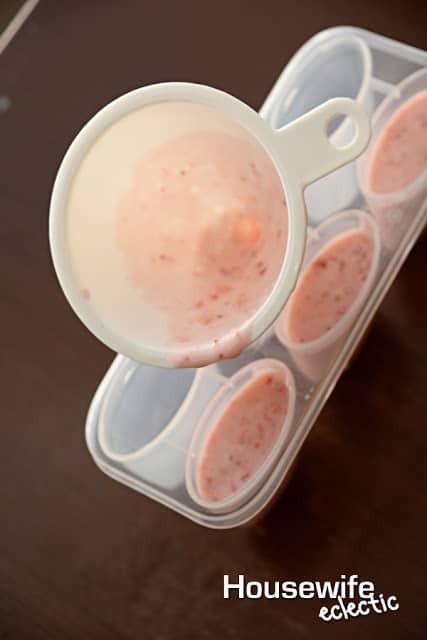 Even though my kiddos are way past the teething stage, I know they'd love these frozen treats! Teething is the worst! I always felt so helpless. It's great to know there's something you can do to help them feel better. This is such a great idea! I wish I had done this for my threee boys years ago! I'll have to save this for the grandkids someday! I was totally expecting the medicine to be mixed right into the pops! I have the hardest time getting my kids to take medicine when they're hurting. But they definitely wouldn't turn down one of those awesome popsicles! They look so delicious! I'll have to save this. The teething is coming soon I just know it! Definitely sharing this info to those I know who have teething babies. Tooth pain is unbearable! I remember when my son suffered from it! Seeing these yogurt pops make me want some right now. I had no idea that kids can experience cold-like symptoms when they are teething. Great idea! I bet lots of kids would love the popsicles. What a really great idea. I remember how awful teething was for my daughter.